A listen to a late-night metal radio program brought me in contact with Horrified's new album, Allure of the Fallen, which breaks little new ground but provides the listener with a highly satisfying melodic death experience. Starting out as a Carcass-inspired melodeath act, in recent years their sound has been taking on some blackened qualities that are on display in the latest offering, as well as a healthy dollop of doom served at the end. The melodic part has been kept during the band's evolution, and is used well here. The title track has got a mid-tempo rock beat that allows for some smooth soloing, but we can also see some doomy, down-tempo parts too towards the end. 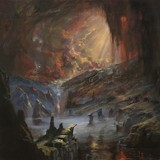 Light's Dissolution, on the other hand, is a melodic black piece, filled with harmonized tremolo picking and blastbeats. Despite the old-school melodeath vibe, the production's silky-smooth, and the fine soloing is allowed to rush over the often much slower beats in a ferocious tidal wave of picking. Perhaps it's wrong to call this a throwback to extreme-metal days of yore, though no doubt plenty of reviewers are doing so. Horrified has their own interpretation of the music of the classic melodeath era, and while one can still hear their predecessors' influence, they've got touches on here all their own. The doomy riffing on the last few tracks provides a grim solemnity to the sound, moving away from some of the faster riffing at the beginning to a pace that really crawls. The last track, The Promise of Solace, picks up the pace a little, but not by much; trying for an epic finale, it has difficulty getting the album to start moving after the knuckle-dragging of its predecessors. Those who liked the similarly-named Horrendous's two releases will probably enjoy this one too, as it strikes a similar note, although taking more influence from other extreme metal genres. Allure of the Fallen is a very solid showing from a band able to build on the legacy of their influences to create a sound of their own.